Air Waybill compliant with new IATA Resolution 600b, effective as of December 30th 2009, replaces Resolution 600b(II). 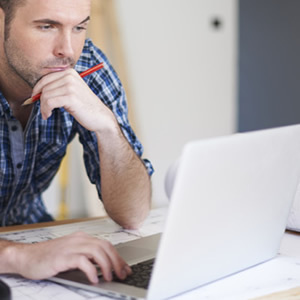 A Pro Forma invoice is a preliminary bill of sale sent to buyers in advance of a shipment or delivery of goods. The Commercial Invoice will typically describe the purchased items and other important information such as the shipping weight and transport charges. 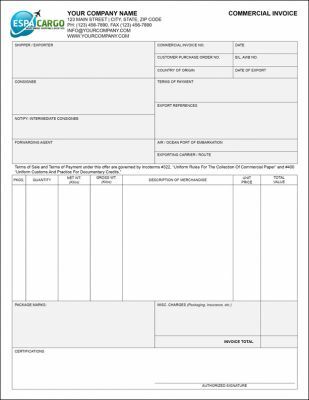 Pro forma invoices are often used for customs purposes on imports. To ship dangerous goods, consignors are required to prepare a form certifying that the cargo has been packed, labeled and declared according with the IATA Dangerous Goods Regulations (DGR). To ship dangerous goods by vessel, use IMO Dangerous Good Declaration. 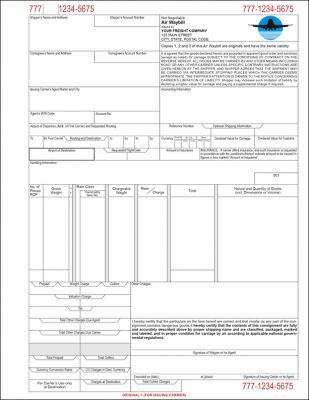 This form package is bundled with forms for use with Microsoft Word and PDF fillable forms, for use with free Adobe Reader. 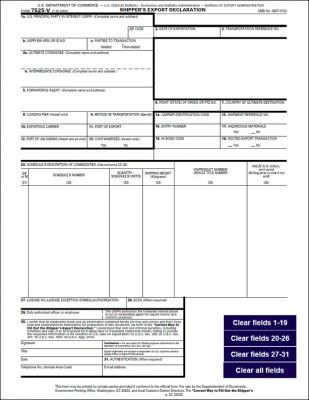 A form that an exporter or a shipping company must file with the U.S. Department of Commerce if the value of the commodity one is exporting exceeds a certain value. In 2000, this value was $2,500. The form is administered by the U.S. Census Bureau. 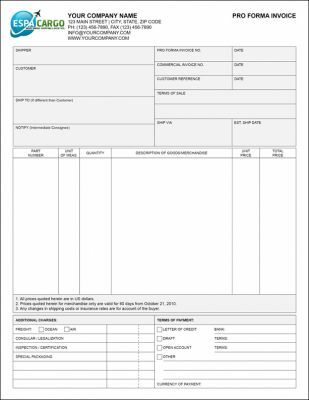 Form contains ample space for shipper's and consignee's, ship from and ship to addresses, phone numbers, etc. It also contains a section to be used as a packing list. Declaration signature to attest for the contents of the shipment. 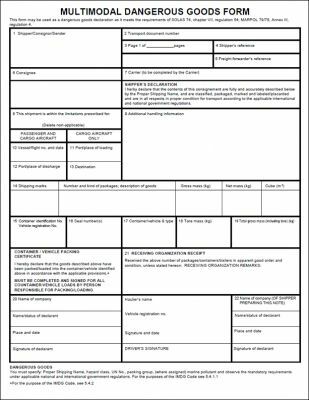 The PDF version of this form is a fillable form. This is a document containing a record of the transaction between a seller (exporter) and a buyer (importer), containing information such as a complete listing and description of the goods including prices, discounts and quantities, and the delivery and payment terms. A commercial invoice is often used by government's to determine the true value of goods for the assessment of Custom duties, and must therefore conform to the regulations of the importing country. 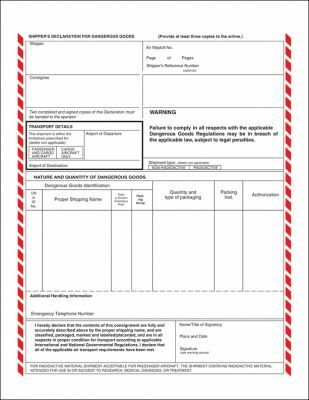 Stay in compliance when transporting hazardous materials on cargo and passenger ships with the IMO Dangerous Goods Declaration Form. 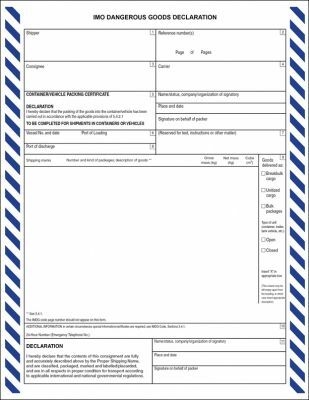 The form includes specific information such as commodity, hazard classification, shipper, receiver, point of origin and final destination. They meet shipping requirements set by SOLAS 74, chapter VII, regulation 4; MARPOL 73/78, annex III, regulation 4; and IMDG Code, chapter 5.4. You can rest easy knowing you’re compliant when shipping hazmat products overseas on maritime carriers. The Multimodal Dangerous Goods fillable, form is the declaration recommended by the International Maritime Organization (IMO). The Multimodal Dangerous Goods form is provided to expedite the movement of hazmat shipments between modes, e.g. truck to ship. A U.S. 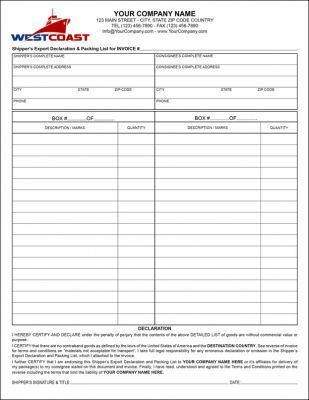 Shipper's Export Declaration (SED) form that an exporter or a shipping company must file with the U.S. Department of Commerce if the value of the commodity one is exporting exceeds a certain value. In 2000, this value was $2,500. The form is administered by the U.S. Census Bureau.